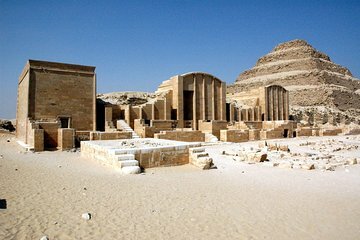 Explore the ruins and relics of Egypt’s oldest capital on a 4-hour tour of Saqqara and Memphis with an Egyptologist guide. Learn how Djoser’s pyramid revolutionized ancient architecture then hear stories about ancient Egypt’s most colorful figures as you walk the necropolis. Stand on the site where the pharaohs were crowned at the temple of Phata and visit the towering statue of Ramses II. Trace the story of Egypt’s kingdoms in Memphis’ exquisite reliefs and enjoy the rich, historic atmosphere of this UNESCO site before returning to your Cairo hotel.